Always Aubrey: Dragon Child on "Battle Hymn of the Tiger Mother"
After much hesitation, I finally read Amy Chua's controversial book, Battle Hymn of the Tiger Mother. This self-described satirical memoir chronicles Chua's decision to raise her children in the "Chinese style" of parenting, which is basically the complete opposite of the popular "attachment parenting" and laissez-faire parenting permeating in the U.S. these days. While some praised Chua for speaking about her strict parenting rules and stories, others accused her of being downright abusive... mostly those who had not grown up with nor prescribe the sort of parenting she wrote about. These days, it seems like parents want to be friends with their kids. Not so in immigrant households. I hesitated to read this book because of my own upbringing. As the half-Korean daughter of an American father and immigrant mother, I felt like I had a wonderful childhood; but when I described to friends and coworkers the additional homework given to me after school by my mother (starting in kindergarten) and the numerous tutors who kept me from receiving the dreaded A- (mentioned on Glee as the"Asian F") they act as if I didn't have an idyllic experience at all. I wouldn't say that my mother was completely like Amy Chua. I was allowed sleepovers, provided I had finished my homework and extra credit and musical practice. (She stopped enforcing musical practice after middle school. I had quit piano to take up clarinet, though I was pretty good at it despite lacking musicality.) But our family did sometimes refer to Mom as "The Dragon Lady", and my academic career was not easy. I don't even think I was naturally bright, I just worked at it ALL THE TIME. I did have my first tutors and after-school lessons in kindergarten and 1st grade. My mother always felt like I should be ahead of my grade level; she bought me the books "Everything Your 3rd/4th Grader Needs to Know" when I was in 1st grade. While my fellow 1st graders were just learning to read, I was sent to the kindergarten to read books aloud to the younger kids. Video games were banned; I played with Brainquest flashcards and Reader Rabbit/Math Blaster. We did not celebrate anything but 1st place. I cried in shame for days when I got my first B+, a mid-term grade in 4th grade science. I was pushed by my math tutor to memorize multiplication tables well before the subject ever came up in school. I hated my piano lessons and the timed practices. I took solace in Girl Scouts and sports, my time away from academia. I quit choir to focus on more "practical" endeavors. I didn't have close friends until high school; I spent the time reading instead. I had a t-shirt that said, "Future Harvard Freshman". My mother was not abusive, even as the Dragon Lady. Sure, there were screaming matches. I do remember her chasing me with a spatula once, yelling that I needed to practice piano. She was overly and embarrassingly involved, going to the high school to ensure I was placed in all of the most difficult Honors classes, even convincing them to waive prerequisites; I would do the work over the summer under her supervision. I was forced to participate against my will on the spelling team to improve my SAT English score. She was angry when I used free elective time to take painting class instead of an additional "academic" class. I always remember my Dad being the affectionate parent, doling hugs and kisses all the time. I don't remember it being that way with my Mom; she was an authority figure. As I got older, I was allowed to be left to my own devices so long as my grades remained straight A's. If I faltered, my free time was spent in tutoring. My "American" friends didn't understand it. They thought it was cruel, that my parents were terribly strict. They assumed I was miserable. Only my friends with Asian mothers understood it, and we compared stories regularly. But I excelled. Looking back, I don't know how I managed the list of activities I participated in, the difficult course load, varsity athletics, and a part-time job. I even had a boyfriend, once I was sixteen. I was always ahead of my grade level in reading, mathematics, even speaking pretty fluent French by the time I graduated. I got into a top tier university, the most difficult school to gain admittance to the year I applied. I graduated from that school with honors (despite some horrifying B's and C's on my report card!) and am headed in a great direction with my career. 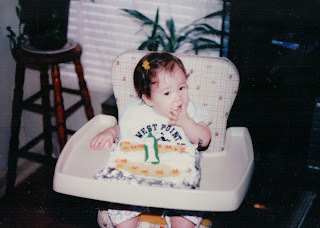 On my 1st birthday, with a bib displaying my future alma mater. My sister, on the other hand, did not take to this parenting method whatsoever. Chua's daughters had a very similar reaction. I was obedient, academic, driven, and persistent. Younger, Sissy was rebellious, resistant, dramatic, and fought it every step of the way. In fact, I sometimes feel that my mother was the Dragon Lady with me, and not Sissy; Sissy didn't have to deal with the same pressures that I did, because she fought so violently against them. It frustrated me that my parents could not stand their ground with her, but would enforce their standards upon me. I obeyed, however grudgingly. Unlike Chua, my mother was not Ivy League-educated or raised in America. Although extremely intelligent (she learned the Cyrillic alphabet for a weeklong trip to Russia), she never got to finish college, mostly because she had me. The Dragon Lady did not want her children to miss the opportunities that she had. She never wanted to be our friend; in fact, she endured endless rounds of us screaming how much we hated her. (Children are cruel.) But now, as I reflect, I'm so glad I had a caring, involved mother. She did prepare me for the world... I know what winning feels like, and I know what losing feels like. I'm not overly sensitive, nor do I feel any sense of entitlement. I respect my elders, even when I feel they are wrong. I am realistic and practical. I am driven. Once, looking back on all the fights we'd had over schoolwork, I asked my Mom if she still thought her method was the right thing. She looked at me very matter-of-factly and said, "You went to West Point, didn't you?" I realized that she endured that torture, being the "mean" parent, because "tough love" was the way she showed how much she cared. She was willing to sacrifice the "Gilmore Girls" relationship with her daughter in order to help me succeed. She celebrated our achievements and held us through disappointments. After over twenty years of patience and pushing, I had proven to her that it was all worth it through my acceptance and matriculation from a top university, which would help me for the rest of my career. And after over twenty years of dealing with a Dragon Lady, I count her as one of my best friends.